I opened every post with the #cook90 hashtag, so I thought I'd change things up today. 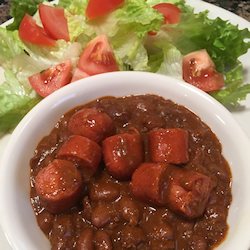 I sure hope that eating up left-overs counts as eating from the pantry. At least I avoided adding more food to the freezer. Other than the left-overs, food coming from the pantry were some frozen chicken breasts and a box of Girl Scout cookies. 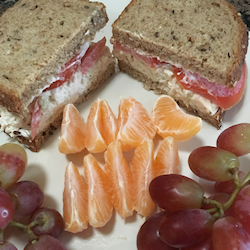 In spite of the fact that I'm still not eating breakfast most days, I am meeting my goal/challenge of eating all meals at home instead of going out. 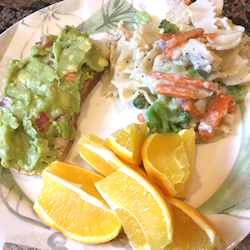 For lunch, I warmed the left-over bow tie pasta dish, toasted some sour dough bread (and topped mine with guacamole), and sliced up a navel orange. At supper time, I pulled three chicken breasts from the freezer and tossed them into a pot of seasoned water to poach. Put one of the breasts away in the fridge to use in stir fry tomorrow night, and sliced the two remaining breasts and browned them in the skillet. 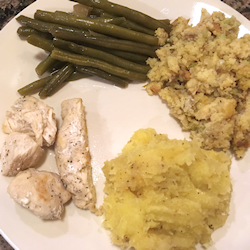 Served the chicken with left-over green beans, cornbread dressing, and mashed acorn squash. 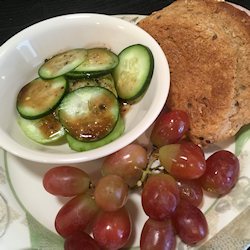 For dessert, I opened a box of Girl Scout Shortbread cookies and served them with fresh fruit—grapes for Steven and a pear for me.